Draw scales on a number of Poly Cups using School Colour Markers. Press a hole in the base of the Poly Cups with a pencil and thread a length of wool through these holes. 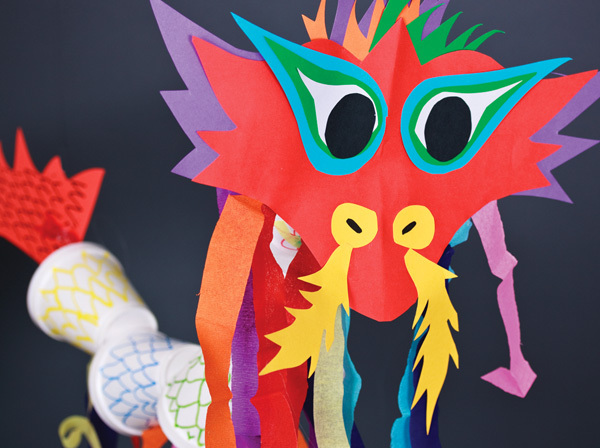 Use various colours of Cover Paper to create and collage a head for the dragon. Cut a tail from Cover Paper and draw on scales with the markers. 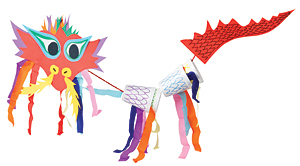 Cut strips of Crepe Paper and glue them to the head and body of the dragon. Add fishing line to suspend.